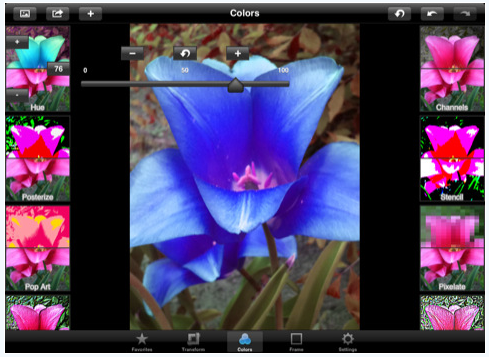 We have long been fans of Photogene for quick crops and applying effects to photos on our iPads. Photogene has gone through many updates over the last year and it is still hard to beat for features. What we like about it is the speed of use and that we don’t have to be a Photoshop expert to get more bang out of our images going into presentations and documents. Part of the ‘ease of use’ for Photogene for iPad might be due to it’s familiar interface. 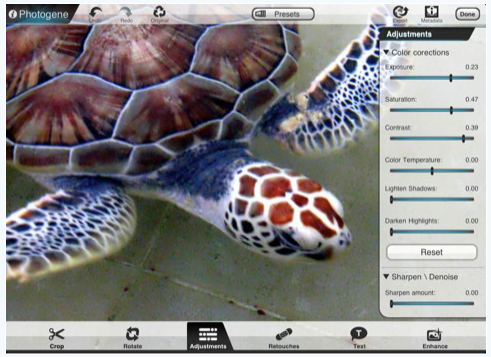 Many effects can be applied to images (Customizing and Touching Up photos on the iPad). When a group is chosen, examples of that filter applied appears on the side in portrait view and across the bottom in landscape view. Choose one to apply, ‘undo’ in the upper left corner let’s you change your mind. Many filters come with fine tuning adjusters. 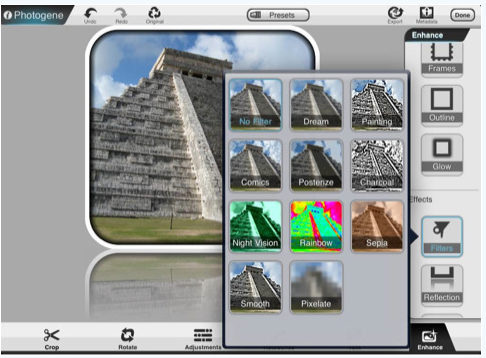 Photogene handles the tool set by sliding it in from the side. While we have been quite happy with the tools, a client came in and was seen adjusting some photos on their iPad using a different interface. It was just enough different that the app found it’s way around the office pretty quickly. 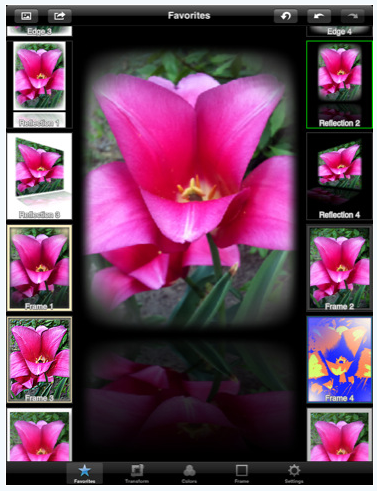 The universal app, Photo Factory, has many similar filters and tools we have been using, but the layout is different. The interface is much more about quickly flipping through MANY photo adjustment options to find what you need, and move on. When there is a need to fine tune a filter, Photo Factory places the sliders over the top of the image your working on. No need for a tool box that causes the work area to be covered with the box or minimized. Honestly, some folks didn’t like having the tools on the image. That might be because they are used to tool boxes on their desktop and the iPad is offering different UI options. Currently priced the same as Photogene, Photo Factory may be an option you should look at when making a decision on which photo editing app you want on your iPad. It really comes down to personal preference. 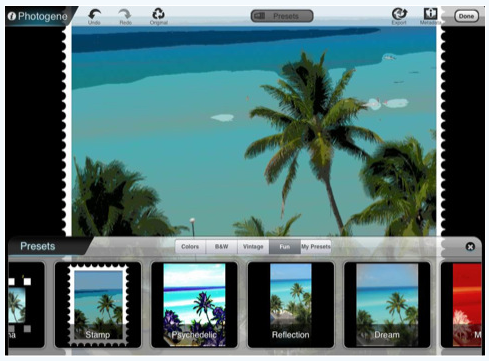 We should mention that since Photo Factory is ‘universal’ you buy once and can install on both your iPad and iPhone. – Select predefined color effects from Favorites. – Add your own combination of color effects to Favorites by pressing the + button in the top bar. Deleting of Custom Favorites will be available soon. – Each effect icon shows your photo with the effect applied. – Same user interface for all effects: press the + button to increase the effect, press the – button to decrease. – Tap the number button on an effects icon and a slider appears for a more accurate effects value. Double tap the number to set the value back to 0. – All effect values can be changed at any time. – Effects are immediately merged together in the background and continuously update on screen while you change them. – Contains many color effects and transformations, including perspective, shadow and reflection. – A single tap on the photo shows/hides the effects icons (full screen), a double tap zooms in/out and a 2 finger tap shows the original/changed photo. – Multiple undo and redo. Reset button clears all effects at once (can be undone). – Mark often used effects for quick access or view only the effects that are currently in use. – Import photo: Camera, Photo Library, Previous Session, Paste from clipboard. – Export photo: Save to Photo Library, Copy to clipboard, Email, Print with AirPrint, Print to EFI software RIPs like EFI eXpress, EFI Colorproof XF and EFI Fiery XF. Multiple resolutions supported up to the original photo size.